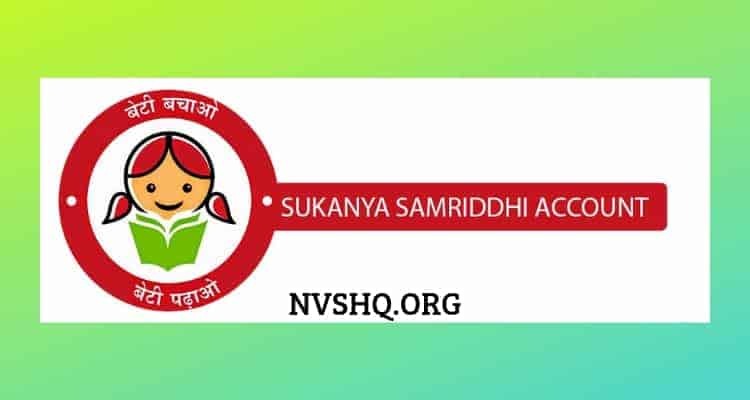 Sukanya Samriddhi Yojana online apply, SSY status check, eligibility, chart, benefits: Sukanya Samriddhi Yojana (SYY) is a saving scheme launched by the Government of India in the year 2014. Ministry of Women and Child Welfare, Govt. of Indian has launched the scheme as a part of “Beti Bachao, Beti Padhao” campaign. SSY scheme is focused to encourage the parents to save and maximize the funds for the higher education and to meet the marriage expenses of the girl child. Under SSY scheme, a natural or legal guardian can open an account in an authorized bank or post office on the behalf of their girl child. Sukanaya Samriddhi scheme is applicable to the whole population across India. Here in this article, users can find information related to this particular SSY scheme. There are various tax benefits under this scheme as per section 80C of Income Tax Act. The scheme provides higher rates of interest as compared to other schemes in market. The minimum amount to be deposited annually in the account is too low i.e. Rs.250/-. The account under this scheme is transferable across India. Once the girl attains an age of 10 years if she wishes she may operate her account by her own. On maturity of the account girl (having SSY account) gets the proceeds. It has minimal documentation requirement. This scheme is beneficial for both girl and their parents/guardians as it helps both. SSY account can be opened in any of the authorized bank or post office across the country. Account can be opened by the parents or legal guardians of the girl child provided they have to submit the birth certificate of the girl and other required documents. Depositor can open and operate only one account on the behalf of the girl. Guardians or natural parents are allowed to open account under this scheme only for two girls. However, on case of twin girls, they can open a third account as the second birth or in the condition if the first birth is itself a triplet. They have to provide relevant certificate in both the situations to open the account. SSY account is opened with an initial balance of Rs.1000/. After that, depositors can deposit any amount subject to the condition that depositor must deposit a minimum of Rs.250/- and the maximum amount should not exceed one lakh fifty thousand in a single occasion or multiple occasion in a financial year. Depositor can deposit money in the account till the completion of fourteen years from the date of account opening on the behalf of the girl. If SSY account is not maintained annually as per the rule, then such accounts can be regularised by making payment of penalty of Rs.50/- per year along with the minimum subscription amount for the year. Cheque or demand draft drawn in favor concerned bank manager or postmaster. The interest rates are notified by the government and are decided on quarterly basis. It is compounded on an annual basis and is credited to the account till it completes fourteen years from the date of opening of account. The current interest rate is 8.5%. Account holder can also opt for monthly interest. In this case, the same shall be calculated only on the amount in the account on completed thousand and the remaining balance or amount will continue to earn interest as per the prevailing rates. Account opening form- to be obtained from the respective bank. Identity proof of legal guardian/parent- It can include PAN, Passport, matriculation certificate, voter ID, driving license, or any other ID proof issued by the government of India. Address proof of parent/guardian- It can include PAN card, passport, Voter ID card, ration card, electricity bill, telephone bill, or any other proof of address issued by the Government of India. As per the scheme, only females are eligible for this scheme. Only girls under the age of 10 years are eligible to open account. It is the responsibility of their parents/ or legal guardians to open the account in the name of the daughter. A slight relaxation is applicable for the girls who are born on or after 2nd December 2003. On opening of the account, a passbook is issued to the account holder. The passbook holds the name, address, date of birth of the account holder, date of opening of account, account number, and amount deposited. Account holder/parents/guardians are required to present this passbook at the time of deposit, and at the time of final closure of account. Sukanya Samriddhi Account gets mature on the completion of 21 years from the opening of account. People have confusion that Sukanya Samriddhi Account gets mature as the girl turn 21 but this is totally false. There is no connection of age of the girl with the maturity of the account. However, account holder can only withdraw the amount if she attains the age of 18 years and the amount is being used for higher studies and marriage. The account will be closed after its maturity. The premature closure of account is allowed in the event of the death of the account holder on the production of death certification issued by the competent authority. Then the balance is credited to the guardian and account is closed. The amount received at the maturity of the account if tax-free. It is exempted from tax and ensure that the amount can be fully utilized in the development of the girl without the payment of tax. As per Income Tax Act, all the investments made under this scheme are eligible for benefit of tax deduction. Tax deduction maximum of 1.5 lakhs towards SSY is admissible. Under this interest is accumulated, which is compounded and credited to the account on an annual basis. No tax is levied on this accrued/accumulated interest. This allow funds under the scheme to grow to the maximum. Tax exemption can be claimed either by the parent of the girl or by the legal guardian. Only one depositor is eligible for tax exemption under the section 80C of Income Tax Act. Sukanya Samriddhi is one of the best ways to make and secure the future of the girl child. 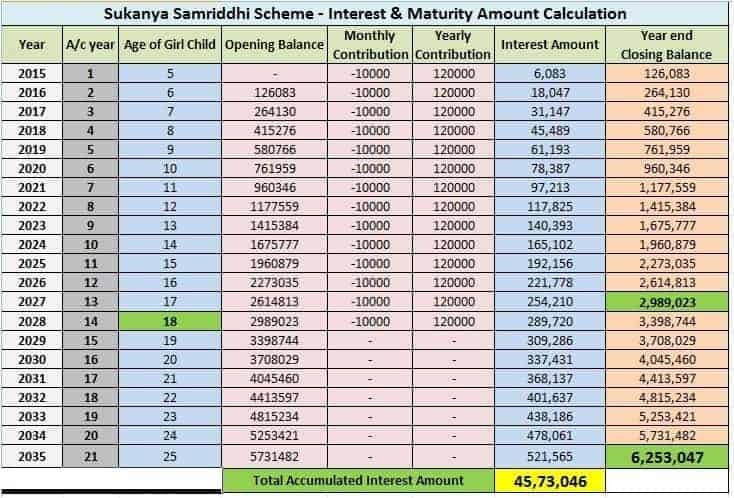 Ques.- What is the maturity period of Sukanya Samriddhi Yojna? Ans.- The account under this scheme will mature after 21 years from the date of opening of account and it does not have to do anything with the age of the account holder i.e. the girl. Ques.- Is Sukanya Samridhi Account Transferable? Ans. – Yes, SYY account can be transferred in any of the authorized banks. Account can be transferred from bank to bank, post office to post office or from post office to bank and vice-versa free of cost. Ques.- Is the presence of girl necessary at the time of opening of account? Ans. – No, only the presence of legal guardians/ parent is required for opening an account in bank or a post office. Ques.- Can multiple accounts be opened in the name of a girl? Ans. – No, a girl can have only one account under this scheme. Ques.- What is the minimum amount that can be deposited annually in Sukanya Samriddhi Yojna account? Ans.- Depositors can deposit a minimum of Rs.250/- annually on the account. The minimum amount was revised in the year 2018; earlier it was Rs.1000/-. Ques.- What is the limit of amount to be deposited in the account in a financial year? Ans. – Depositor can deposit a minimum amount of Rs.250/- and a maximum of Rs.1,50000/- in a financial year. can i oppened an account inspite of my ppf account? 1. Can depositor revise his/her depot amount after opening the Account? for Example if some body has opened the account with 1000/ amount. latter point of time he/she wants to change the deposit amount let’s say 12000/. 2. Can we deposit the amount as monthly basis for SSY account? 3. If Some body depositing 1000 per month, how much money he will receive at the time of maturity of the Account. ?